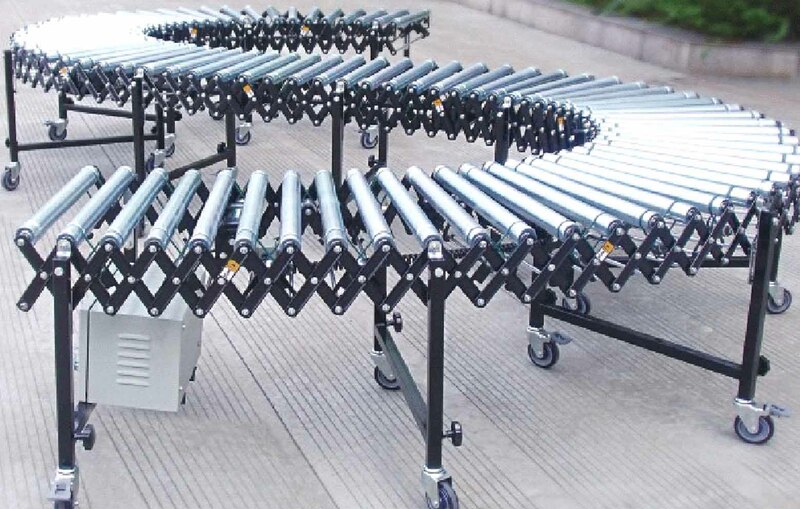 As the name suggests, Flexible Conveyors are extremely versatile and can easily be moved around in the warehouse and can be connected temporarily to existing conveyors or equipment. The conveyors can be twisted which enables non-linear movement of material. Flexible Conveyors are a must have in any production line or warehouse. These conveyors are suitable for environments with changing material handling conveying requirements. They are ideally suited to convey part bins, carton boxes or parcels. The Flexible Conveyors can be collapsed together to make it into a smaller length conveyor. Depending on requirement, they can be stretched to form a longer conveyor which could increase in length over twice the collapsed length. In a stretched condition, the conveyors can also be twisted or turned, enabling moving of parts between two points which may not be in a straight line. The ability to increase or decrease the heights at each end of the conveyor enables transfer of products between two different heights. The Flexible Gravity Roller Conveyor and Skate Wheel Conveyor are most efficient for pushing the product, or, letting products move by gravity. The Flexible Motorized Roller Conveyor are suited for conveying parts over longer distances without the need for operator efforts. All conveyors come with options of different widths and roller diameters depending on the application.